If you need a new set of dentures your first step is to book a free consultation with us. We will discuss the options available to you taking into consideration your personal views and your dental history. We have a wide range of teeth, made from a variety of materials, available at different prices. You can also include optional extras. Our personalised work means we can help you choose the correct colour, size and shape of false teeth to ensure your dentures are aesthetically pleasing and complement your facial shape and complexion. If you have retained some of your own natural teeth we aim to match their colour and shape to ensure your denture looks as natural as possible. First Impression: we will take our first impressions and confirm in writing what has been agreed and the total cost. Bite: your second visit will usually involve making a wax bite and a more detailed secondary impression may also be taken. Wax try-in: this stage is very important as it is a wax replica of your finished denture. You will be able to see how your new teeth will look. If you wish to change the shape, colour or position of the teeth you should let us know at this stage before the denture is finished. Fitting your new dentures: your dentures will be fitted, and their comfort, function and aesthetics will be checked. Check-up: we will then book you in for a check-up so that any other adjustments can be made if necessary. 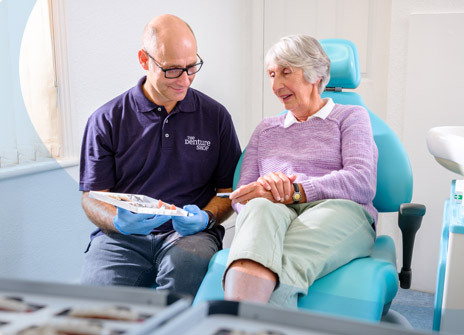 We pride ourselves in providing exceptional after care and will book you in for further check-ups if required to try to make your dentures feel as comfortable as possible. We politely request that if you have a cough or cold to please reschedule your appointment to avoid the possibility of making other patients and our staff ill. Thank you. New ace: these are our basic set of teeth. They offer good value for money and are available in a range of colours and shapes. Natura: these are harder than the New Ace teeth and offer a greater range of colour and shapes. Crown: these are ideal mid-range teeth offering good wear resistance and a wider variety of colour and shapes. Ivoclar: these teeth have an excellent reputation for durability and provide a very natural look. They are made by a long-established company and have excellent wear and aesthetic qualities. They are the strongest of the acrylic teeth and from experience have a life length of six to ten years if cared for well. Enigma life: these teeth are made out of composite resin; the same material as dental crowns and fillings are made from. They are the newest teeth on the market, look extremely natural and are very hard wearing. Swiss denture: uses teeth made of a composite material. These superb teeth are ideally used in conjunction with our specialist manufacturing techniques for an excellent fitting denture and an outstanding natural look. Acrylic: we offer standard acrylic or a superior high impact acrylic. Chrome cobalt: we use vitallium alloy. These are less bulky and much stronger than acrylic dentures. Titanium alloy: these are stronger and much lighter than chrome castings. Nylon flexible dentures: light flexible partial dentures usually preferred by people who have allergies to acrylic or metal. Clear or tooth coloured clasps: for a less visible attachment to your existing teeth. Gold clasps: preferred by some patients for cosmetic reasons. Soft lining: for additional comfort. Tissue colouring and contouring: a process used to make the acrylic mimic natural gum colouring and shape. Anatomical articulation: to ensure better function when chewing. We have four clinics across Sussex and Surrey in Horley, Horsham, Redhill, and Worthing, which are available for new denture appointments. Speak with one of our dedicated staff today and learn more about how we can help you. Please view our contact details for phone numbers and you can also take a look at our frequently asked questions, which may help.